A couple of weeks ago we had our weekly Family Home Evening. For our activity, Xander shared a few magic tricks that he had learned at his most recent Cub Scout Pack Meeting. There were actually pretty good. He's an excellent little showman. While Xander was educating us, Parker had a great idea. He asked my permission to do the "egg trick" with one of the kids. 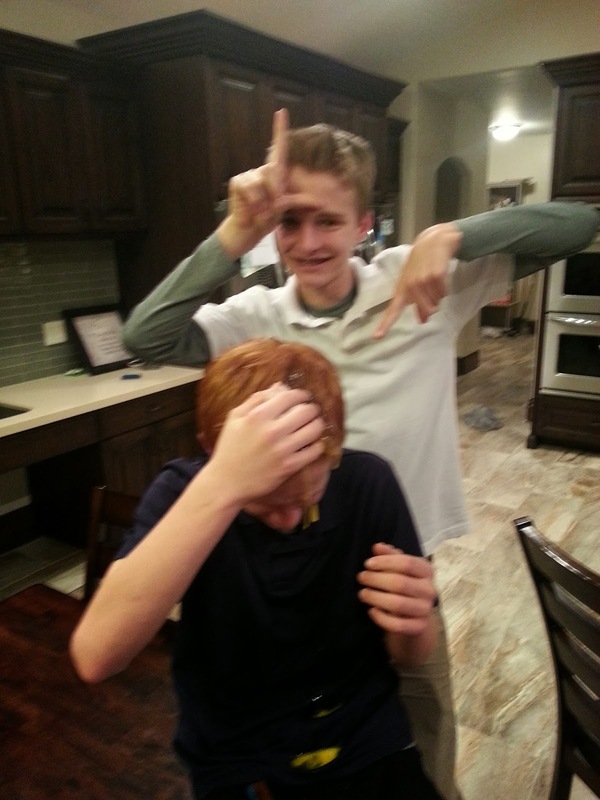 I weighed the pros and cons, and being a tad bit immature myself I figured the entertainment value was well worth the frustration of the poor victim:) "You bet!" I said. So Parker prepared. He slipped into the other room, poked a pinhole into both sides of a raw egg and blew out the entire contents of the egg into the sink. He now had in his possession a hollow egg which looked like any normal egg except for two almost unnoticeable pinholes. The plan was for him to stand in front of the family with two eggs on the table, pick up the hollow egg, say a few magic words and then smash it on his head with no adverse repercussions. He would then ask for a volunteer, coach them through picking up the other (normal) egg, help them say the magic words and then watch in amusement while the poor volunteer cracked a very real, very messy egg on their own head. Brothers are so kind and thoughtful, no? He called the family over to the kitchen table. Both eggs were sitting next to him. He covered them with a dish towel, mysteriously waved his hand over them while spewing forth some gibberish mumbo jumbo and then whipped the towel away with a flourish. 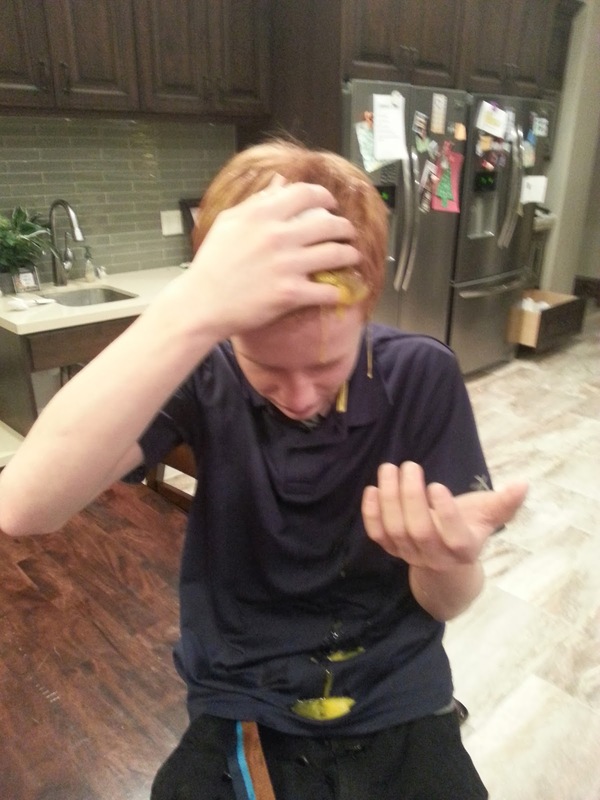 At this point I was beginning to wonder how he knew which egg was which. 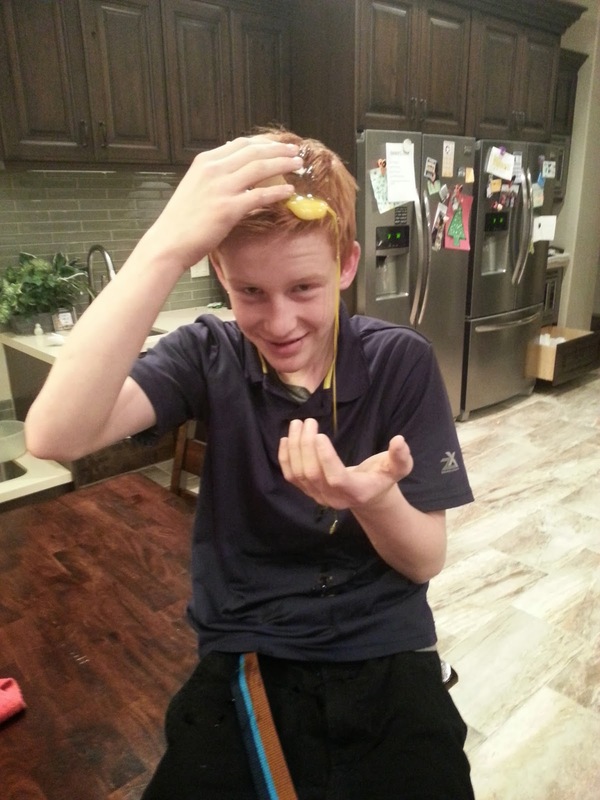 He quickly picked one up and…smashed the very real, very messy egg right on his own head. His expression in the moment was priceless. I about suffocated I was laughing so hard. It was actually the perfect ending to the trick. The rest of us were even more entertained than if he had done the trick correctly, and the only victim was the little scoundrel who was trying to give someone else an egg shampoo! Justice was indeed served. As Parker was talking about it later, he said everything went too quickly. "I thought it felt a bit heavy as it got close to my hair, but it was too late by then…." I know this much: if Parker ever wants a volunteer for the old "saw the assistant in half" trick, I am NOT raising my hand! Ha! Ha! I'd feel sorry for you, Parker, but in this case...not so much!